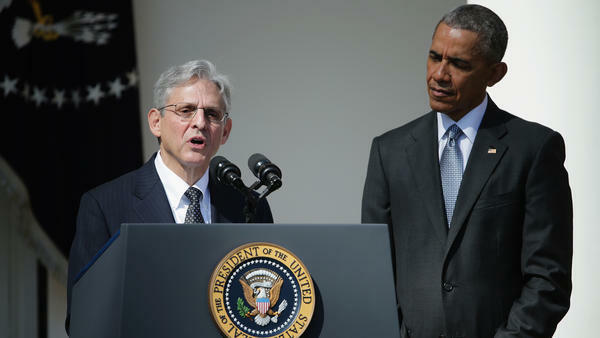 Merrick Garland was nominated to the Supreme Court by President Barack Obama in March 2016. The Senate never voted on his nomination. So much has happened in the past two years that many may have forgotten what happened to Merrick Garland in the spring of 2016. But filling in that recollection goes some distance in explaining a lot of what has happened since. To recap, Garland was nominated to fill the 2016 vacancy on the Supreme Court created by the death that February of Justice Antonin Scalia, an icon of conservative jurisprudence. President Barack Obama quickly named Merrick Garland, then 63, to fill the seat. Garland had long been considered a prime prospect for the high court, serving as chief judge on the U.S. Court of Appeals for the District of Columbia Circuit — a frequent source of justices that is sometimes called the "little Supreme Court." Widely regarded as a moderate, Garland had been praised in the past by many Republicans, including influential senators such as Orrin Hatch of Utah. But even before Obama had named Garland, and in fact only hours after Scalia's death was announced, Senate Majority Leader Mitch McConnell declared any appointment by the sitting president to be null and void. He said the next Supreme Court justice should be chosen by the next president — to be elected later that year. "Of course," said McConnell, "the American people should have a say in the court's direction. It is a president's constitutional right to nominate a Supreme Court justice, and it is the Senate's constitutional right to act as a check on the president and withhold its consent." Supreme Court picks have often been controversial. There have been contentious hearings and floor debates and contested votes. But to ignore the nominee entirely, as if no vacancy existed? There was no precedent for such an action since the period around the Civil War and Reconstruction. No Democratic president had made an appointment while Republicans held the Senate since 1895. In a speech that August in Kentucky, McConnell would say: "One of my proudest moments was when I looked Barack Obama in the eye and I said, 'Mr. President, you will not fill the Supreme Court vacancy.' "
McConnell was not alone. The 11 Republican members of the Senate Judiciary Committee signed a letter saying they had no intention of consenting to any nominee from Obama. No proceedings of any kind were held on Garland's appointment. The court had to convene that October with only eight justices, divided often between the four appointed by Democrats and the four appointed by Republicans. Short-handed, the court deadlocked on a number of issues and declined to hear others. Democrats were outraged, of course, but were short of tools with which to respond. As the minority party — following a disastrous midterm in 2014 — they could not force a committee or a floor vote. They gave speeches, and they urged voters to turn out in protest in the November elections. A federal lawsuit was filed to compel McConnell to hold a vote on Garland. It was thrown out because a judge said the plaintiff, as an ordinary voter, had no standing to sue. For his part, McConnell argued that the Democrats had at least contemplated a similar tactic back in 1992, when Obama's vice president, Joe Biden, was chairman of the Senate Judiciary Committee and mused about urging President George H.W. Bush to withhold any nominees to the high court until the end of the "political season." At the time, the Senate had just been through a bruising battle over the 1991 confirmation of Justice Clarence Thomas. As it happened, no vacancy occurred in 1992. But McConnell and others referred to the "Biden rule" nonetheless in justifying the blockade of Garland. With or without such justification, McConnell's blockade was doubly effective just as a power move. First, it prevented the seating of a Democratic president's choice. Had he been considered, Garland might have pulled a few majority-party members across the aisle. Supreme Court nominees nearly always win at least some votes from the party opposing the president, and Garland had a strong law-and-order history. Had he performed well on TV, voting against him might have been harder — especially for Republicans seeking re-election in competitive states. Second, and more important, the vacancy became a powerful motivator for conservative voters in the fall. Many saw a vote for Trump as a means to keep Scalia's seat away from the liberals and give the appointment to someone who promised to name anti-abortion justices supportive of Second Amendment gun rights. Again and again in the fall, candidate Donald Trump treated the Supreme Court as a touchstone, sometimes simply shouting the two words to his rally crowds. And indeed, polling has shown the court vacancy did mean a great deal to Trump voters, especially those religious conservatives who had personal misgivings about him. Now, of course, McConnell's calculus has changed. With a slim but steady majority of the Senate, and Vice President Mike Pence available to break a tie, McConnell feels confident he can confirm Trump's nominee and get his people out to vote again — this time, in gratitude. Democrats see all this as what their Senate leader Chuck Schumer called "the height of hypocrisy." But will that move voters in their direction more now than it did in 2016 or motivate the disaffected within their base? Some say the Democrats hurt themselves two years ago, first with a nominee who would not excite the party's base. Whatever his evident virtues, Garland was another white male who, as a 63-year-old moderate, could not promise decades as a liberal warrior. There is also ample evidence that the Supreme Court motivates conservatives more than it does progressives. That has often been the case since the Roe v. Wade abortion legalization decision in 1973 launched an era of social issue backlash that split the old Democratic coalition. It also has been argued that the Democrats caved to McConnell's pressure tactics in the Garland case. They should have found a way to force a vote or "shut down the Senate" to light a spark. But Democrats are generally averse to government shutdown strategies, especially considering the potential blowback on their own candidates. In 2016, it was still the Obama era and the Democrats' executive administration. Shutdowns rarely help the party perceived to be in power, even if it's not really in control. So it was safer, in the judgments of spring and summer 2016, to let the Republicans look intransigent and unfair and hope somebody noticed. Perhaps the injustice to Garland would help Democrats win seats in supposedly blue states such as Wisconsin and Pennsylvania, and even red ones such as Missouri and North Carolina. Instead, the country moved on. There were highly contentious primaries in both parties and plenty of other news to preoccupy everyone. Besides, and lest we forget, the Senate Democrats and most everyone else thought they had an insurance policy on the Scalia vacancy. The assumption was that Hillary Clinton would be elected. Clinton, who did, after all, win the popular vote by several million votes, might even have helped carry in a Democratic Senate. And then she could have renominated Garland, or someone younger and more liberal. As it sorted out, the Democrats were cautious, overconfident and misinformed about the mood of the country. They lost in Wisconsin, Pennsylvania, Missouri and North Carolina, winding up still in the minority. That left them powerless to stop McConnell from eliminating the filibuster for Supreme Court nominees in 2017, paving the way to confirmation of Trump's first choice and probably his second. And that is the predicament in which they find themselves today.